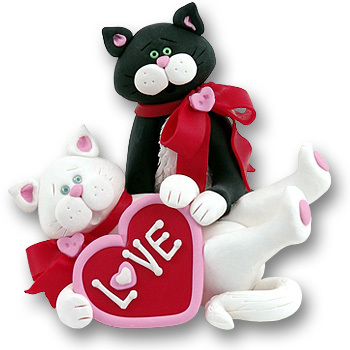 These playful kitty cats are the perfect figurine to give to your Sweet Heart. A great way to share the "Love". It is the Valentine that will last forever. It is a very detailed three dimensional figuring. Great to send as a gift and then can be used as a remembrance on any shelf. Handmade from polymer clay and designed by Debi Allison. It does NOT have a hook.